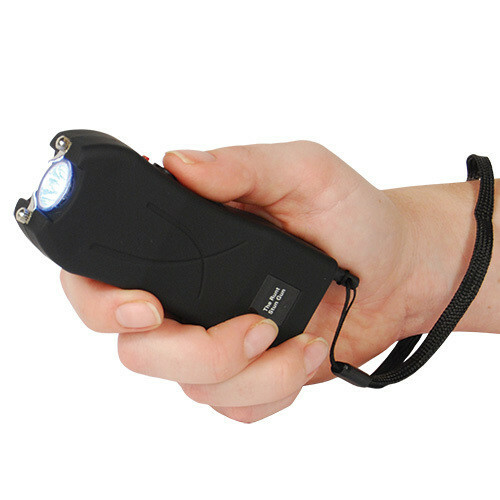 THE RECHARGEABLE 20 MILLION VOLT RUNT STUN GUNS now has an LED flashlight and wrist strap disable pin. It’s easily concealable, and virtually undetectable in the hand of a woman or a man. The Runt uses a new cutting edge micro-technology to deliver super powered protection. You can carry the Runt in your hand or pocket. It also has a rubberized coating for a better grip. If you would like to wear it like a cell phone there is a heavy duty nylon belt loop holster included. Available in 6 colors: Black, Pink, Red, Purple, Green, and Blue. Features: Nylon Belt Loop Holster included (matching leatherette holster sold separately), Rubberized Coating, Disable Pin Wrist Strap, Built-in LED Flashlight, LIFETIME WARRANTY.